Few customer-supplier partnerships are equal. Buyers need to be wary of entering into dependent relationships where the supplier will gain a dominant position. This is the second part of a 2-part article which sets out to examine how and why Procurement might consider the supplier’s perspective when selecting suppliers. It is particularly relevant for strategic supplies, where value creation and value capture are key objectives. In the first part, I covered Purchasing Portfolio Analysis and Customer Account Analysis from the supplier perspective. My preference is to use Kraljic’s matrix for the former, and an adaptation of Directional Policy Matrix (DPM) for the latter. DPM takes account of the dynamics of the supplier’s postion whereas the Supplier Preferencing matrix (more commonly used by Procurement) only considers the present, and is therefore deficient for the purpose of evaluating strategic relationships. 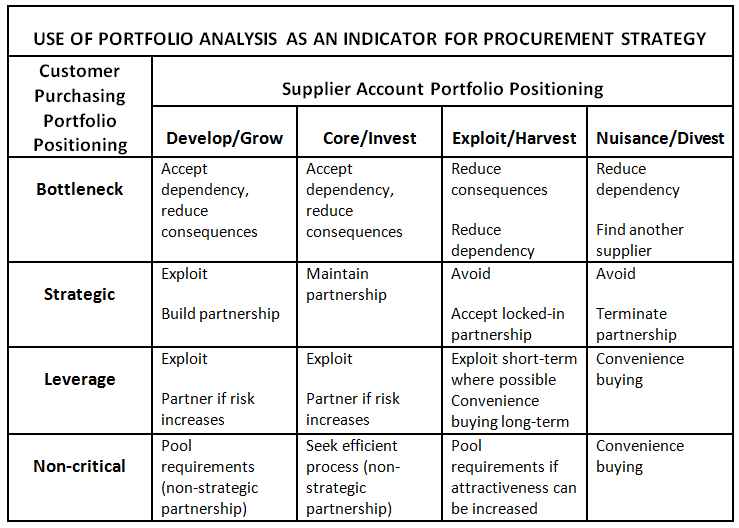 By mapping the suppliers’ account portfolio positioning against purchasing portfolio positioning, the buyer can derive appropriate strategies for each cell of the matrix (Table 1). It is clear, from the buyer’s perspective, that strategic partnerships are to be preferred with suppliers who either position the customer within their core business or within the quadrant where they are commited to growing their capability. The danger in the ‘grow’ quadrant is if the supplier fails to raise its capability, then the competitive disadvantage may impact on the customer’s value chain. Acceptable relationships may be possible within the ‘harvest’ quadrant but the likelihood is that the buyer’s influence will be low, and the power with the supplier. Supply positioning models propose partnerships within the strategic quadrant, but fail to reflect the potential for mutually beneficial relationships within other quadrants. There is often potential for partnerships of some form in other quadrants, notably partnerships to mitigate risk in the bottleneck quadrant, and to improve purchasing efficiency within the non-critical quadrant. We might refer to these as non-strategic partnerships. Portfolio analysis to consider suppliers’ general suitability, in particular for strategic categories, and also for non-strategic partnerships. Supplier appraisal to examine in detail strategic suppliers’ and potential partners’ capabilities and intentions. The first and third steps are covered in the related articles listed below. This entry was posted in Procurement, Procurement Techniques, Supplier Selection, Supply Chain and tagged Customer Account, Partnership, Portfolio Analysis, Procurement, Purchasing, SRM, Supplier Relationship, Supply Chain Management, Techniques, Value Chain by Tony Colwell. Bookmark the permalink.